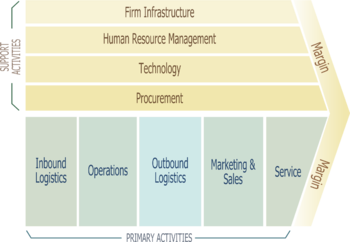 Strategic management provides overall direction to an enterprise and involves specifying the organization's objectives, developing policies and plans to achieve those objectives, and then allocating resources to implement the plans. Academics and practicing managers have developed numerous models and frameworks to assist in strategic decision-making in the context of complex environments and competitive dynamics. Strategic management is not static in nature; the models often[quantify] include a feedback loop to monitor execution and to inform the next round of planning. creating a "unique and valuable [market] position"
making trade-offs by choosing "what not to do"
Corporate strategy involves answering a key question from a portfolio perspective: "What business should we be in?" Business strategy involves answering the question: "How shall we compete in this business?" Management theory and practice often make a distinction between strategic management and operational management, with operational management concerned primarily with improving efficiency and controlling costs within the boundaries set by the organization's strategy. Some complexity theorists define strategy as the unfolding of the internal and external aspects of the organization that results in actions in a socio-economic context. Peter Drucker was a prolific management theorist and author of dozens of management books, with a career spanning five decades. He addressed fundamental strategic questions in a 1954 book The Practice of Management writing: "... the first responsibility of top management is to ask the question 'what is our business?' and to make sure it is carefully studied and correctly answered." He wrote that the answer was determined by the customer. He recommended eight areas where objectives should be set, such as market standing, innovation, productivity, physical and financial resources, worker performance and attitude, profitability, manager performance and development, and public responsibility. Igor Ansoff built on Chandler's work by adding concepts and inventing a vocabulary. He developed a grid that compared strategies for market penetration, product development, market development and horizontal and vertical integration and diversification. He felt that management could use the grid to systematically prepare for the future. In his 1965 classic Corporate Strategy, he developed gap analysis to clarify the gap between the current reality and the goals and to develop what he called "gap reducing actions". Ansoff wrote that strategic management had three parts: strategic planning; the skill of a firm in converting its plans into reality; and the skill of a firm in managing its own internal resistance to change. Bruce Henderson, founder of the Boston Consulting Group, wrote about the concept of the experience curve in 1968, following initial work begun in 1965. The experience curve refers to a hypothesis that unit production costs decline by 20–30% every time cumulative production doubles. This supported the argument for achieving higher market share and economies of scale. By the 1960s, the capstone business policy course at the Harvard Business School included the concept of matching the distinctive competence of a company (its internal strengths and weaknesses) with its environment (external opportunities and threats) in the context of its objectives. This framework came to be known by the acronym SWOT and was "a major step forward in bringing explicitly competitive thinking to bear on questions of strategy". Kenneth R. Andrews helped popularize the framework via a 1963 conference and it remains commonly used in practice. An increased focus on empirical analysis of costs and processes, a concept which author Kiechel refers to as "Greater Taylorism". 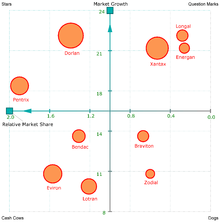 The concept of the corporation as a portfolio of business units, with each plotted graphically based on its market share (a measure of its competitive position relative to its peers) and industry growth rate (a measure of industry attractiveness), was summarized in the growth–share matrix developed by the Boston Consulting Group around 1970. By 1979, one study estimated that 45% of the Fortune 500 companies were using some variation of the matrix in their strategic planning. This framework helped companies decide where to invest their resources (i.e., in their high market share, high growth businesses) and which businesses to divest (i.e., low market share, low growth businesses.) C. K. Prahalad and Gary Hamel suggested that companies should build portfolios of businesses around shared technical or operating competencies, and should develop structures and processes to enhance their core competencies. Peter Drucker wrote in 1994 about the "Theory of the Business," which represents the key assumptions underlying a firm's strategy. These assumptions are in three categories: a) the external environment, including society, market, customer, and technology; b) the mission of the organization; and c) the core competencies needed to accomplish the mission. He continued that a valid theory of the business has four specifications: 1) assumptions about the environment, mission, and core competencies must fit reality; 2) the assumptions in all three areas have to fit one another; 3) the theory of the business must be known and understood throughout the organization; and 4) the theory of the business has to be tested constantly. 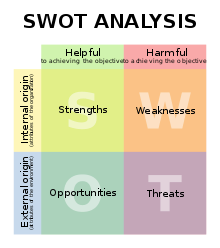 Relationship of internal and external environment: SWOT analysis is one of the most basic and widely used frameworks, which examines both internal elements of the organization—Strengths and Weaknesses—and external elements—Opportunities and Threats. It helps examine the organization's resources in the context of its environment. A number of strategists use scenario planning techniques to deal with change. The way Peter Schwartz put it in 1991 is that strategic outcomes cannot be known in advance so the sources of competitive advantage cannot be predetermined. The fast changing business environment is too uncertain for us to find sustainable value in formulas of excellence or competitive advantage. Instead, scenario planning is a technique in which multiple outcomes can be developed, their implications assessed, and their likeliness of occurrence evaluated. According to Pierre Wack, scenario planning is about insight, complexity, and subtlety, not about formal analysis and numbers. The flowchart to the right provides a process for classifying a phenomena as a scenario in the intuitive logics tradition. Process for classifying a phenomena as a scenario in the Intuitive Logics tradition. A key component to strategic management which is often overlooked when planning is evaluation. There are many ways to evaluate whether or not strategic priorities and plans have been achieved, one such method is Robert Stake's Responsive Evaluation. Responsive evaluation provides a naturalistic and humanistic approach to program evaluation. In expanding beyond the goal-oriented or pre-ordinate evaluation design, responsive evaluation takes into consideration the program's background (history), conditions, and transactions among stakeholders. It is largely emergent, the design unfolds as contact is made with stakeholders. The internet has dramatically empowered consumers and enabled buyers and sellers to come together with drastically reduced transaction and intermediary costs, creating much more robust marketplaces for the purchase and sale of goods and services. Examples include online auction sites, internet dating services, and internet book sellers. In many industries, the internet has dramatically altered the competitive landscape. Services that used to be provided within one entity (e.g., a car dealership providing financing and pricing information) are now provided by third parties. Further, compared to traditional media like television, the internet has caused a major shift in viewing habits through on demand content which has led to an increasingly fragmented audience. In the recent decade, sustainability—or ability to successfully sustain a company in a context of rapidly changing environmental, social, health, and economic circumstances—has emerged as crucial aspect of any strategy development. Research focusing on corporations and leaders who have integrated sustainability into commercial strategy has led to emergence of the concept of "embedded sustainability" – defined by its authors Chris Laszlo and Nadya Zhexembayeva as "incorporation of environmental, health, and social value into the core business with no trade-off in price or quality—in other words, with no social or green premium." Laszlo and Zhexembayeva's research showed that embedded sustainability offers at least seven distinct opportunities for business value and competitive advantage creation: a) better risk-management, b) increased efficiency through reduced waste and resource use, c) better product differentiation, d) new market entrances, e) enhanced brand and reputation, f) greater opportunity to influence industry standards, and g) greater opportunity for radical innovation. Nadya Zhexembayeva's 2014 research further suggested that innovation driven by resource depletion can result in fundamental competitive advantages for a company's products and services, as well as the company strategy as a whole, when right principles of innovation are applied. People are encouraged to see the "whole picture" together. Personal responsibility, self-reliance, and mastery – We accept that we are the masters of our own destiny. We make decisions and live with the consequences of them. When a problem needs to be fixed, or an opportunity exploited, we take the initiative to learn the required skills to get it done. Mental models – We need to explore our personal mental models to understand the subtle effect they have on our behaviour. Shared vision – The vision of where we want to be in the future is discussed and communicated to all. It provides guidance and energy for the journey ahead. Team learning – We learn together in teams. This involves a shift from "a spirit of advocacy to a spirit of enquiry". Systems thinking – We look at the whole rather than the parts. This is what Senge calls the "Fifth discipline". It is the glue that integrates the other four into a coherent strategy. For an alternative approach to the "learning organization", see Garratt, B. (1987). Diagnosis: "This Government, as promised, has maintained the closest surveillance of the Soviet military buildup on the island of Cuba. Within the past week, unmistakable evidence has established the fact that a series of offensive missile sites is now in preparation on that imprisoned island. The purpose of these bases can be none other than to provide a nuclear strike capability against the Western Hemisphere." Action Plans: First among seven numbered steps was the following: "To halt this offensive buildup a strict quarantine on all offensive military equipment under shipment to Cuba is being initiated. All ships of any kind bound for Cuba from whatever nation or port will, if found to contain cargoes of offensive weapons, be turned back." Active strategic management required active information gathering and active problem solving. In the early days of Hewlett-Packard (HP), Dave Packard and Bill Hewlett devised an active management style that they called management by walking around (MBWA). Senior HP managers were seldom at their desks. They spent most of their days visiting employees, customers, and suppliers. This direct contact with key people provided them with a solid grounding from which viable strategies could be crafted. Management consultants Tom Peters and Robert H. Waterman had used the term in their 1982 book In Search of Excellence: Lessons From America's Best-Run Companies. Some Japanese managers employ a similar system, which originated at Honda, and is sometimes called the 3 G's (Genba, Genbutsu, and Genjitsu, which translate into "actual place", "actual thing", and "actual situation"). A 1938 treatise by Chester Barnard, based on his own experience as a business executive, described the process as informal, intuitive, non-routinized and involving primarily oral, 2-way communications. Bernard says "The process is the sensing of the organization as a whole and the total situation relevant to it. It transcends the capacity of merely intellectual methods, and the techniques of discriminating the factors of the situation. The terms pertinent to it are "feeling", "judgement", "sense", "proportion", "balance", "appropriateness". It is a matter of art rather than science." In 1973, Mintzberg found that senior managers typically deal with unpredictable situations so they strategize in ad hoc, flexible, dynamic, and implicit ways. He wrote, "The job breeds adaptive information-manipulators who prefer the live concrete situation. The manager works in an environment of stimulus-response, and he develops in his work a clear preference for live action." In 1982, John Kotter studied the daily activities of 15 executives and concluded that they spent most of their time developing and working a network of relationships that provided general insights and specific details for strategic decisions. They tended to use "mental road maps" rather than systematic planning techniques. Zuboff claimed that information technology was widening the divide between senior managers (who typically make strategic decisions) and operational level managers (who typically make routine decisions). She alleged that prior to the widespread use of computer systems, managers, even at the most senior level, engaged in both strategic decisions and routine administration, but as computers facilitated (She called it "deskilled") routine processes, these activities were moved further down the hierarchy, leaving senior management free for strategic decision making. The 1980s also saw the widespread acceptance of positioning theory. Although the theory originated with Jack Trout in 1969, it didn't gain wide acceptance until Al Ries and Jack Trout wrote their classic book Positioning: The Battle For Your Mind (1979). The basic premise is that a strategy should not be judged by internal company factors but by the way customers see it relative to the competition. Crafting and implementing a strategy involves creating a position in the mind of the collective consumer. Several techniques enabled the practical use of positioning theory. Perceptual mapping for example, creates visual displays of the relationships between positions. Multidimensional scaling, discriminant analysis, factor analysis and conjoint analysis are mathematical techniques used to determine the most relevant characteristics (called dimensions or factors) upon which positions should be based. Preference regression can be used to determine vectors of ideal positions and cluster analysis can identify clusters of positions. James Gilmore and Joseph Pine found competitive advantage in mass customization. Flexible manufacturing techniques allowed businesses to individualize products for each customer without losing economies of scale. This effectively turned the product into a service. They also realized that if a service is mass-customized by creating a "performance" for each individual client, that service would be transformed into an "experience". Their book, The Experience Economy, along with the work of Bernd Schmitt convinced many to see service provision as a form of theatre. This school of thought is sometimes referred to as customer experience management (CEM). Peter Drucker conceived of the "knowledge worker" in the 1950s. He described how fewer workers would do physical labor, and more would apply their minds. In 1984, John Naisbitt theorized that the future would be driven largely by information: companies that managed information well could obtain an advantage, however the profitability of what he called "information float" (information that the company had and others desired) would disappear as inexpensive computers made information more accessible. Daniel Bell (1985) examined the sociological consequences of information technology, while Gloria Schuck and Shoshana Zuboff looked at psychological factors. Zuboff distinguished between "automating technologies" and "informating technologies". She studied the effect that both had on workers, managers and organizational structures. She largely confirmed Drucker's predictions about the importance of flexible decentralized structure, work teams, knowledge sharing and the knowledge worker's central role. Zuboff also detected a new basis for managerial authority, based on knowledge (also predicted by Drucker) which she called "participative management". By the twenty-first century marketing warfare strategies had gone out of favour in favor of non-confrontational approaches. In 1989, Dudley Lynch and Paul L. Kordis published Strategy of the Dolphin: Scoring a Win in a Chaotic World. "The Strategy of the Dolphin" was developed to give guidance as to when to use aggressive strategies and when to use passive strategies. A variety of aggressiveness strategies were developed. Author Phillip Evans said in 2014 that "Henderson's central idea was what you might call the Napoleonic idea of concentrating mass against weakness, of overwhelming the enemy. What Henderson recognized was that, in the business world, there are many phenomena which are characterized by what economists would call increasing returns—scale, experience. The more you do of something, disproportionately the better you get. And therefore he found a logic for investing in such kinds of overwhelming mass in order to achieve competitive advantage. And that was the first introduction of essentially a military concept of strategy into the business world. ... It was on those two ideas, Henderson's idea of increasing returns to scale and experience, and Porter's idea of the value chain, encompassing heterogenous elements, that the whole edifice of business strategy was subsequently erected." Like Peters and Waterman a decade earlier, James Collins and Jerry Porras spent years conducting empirical research on what makes great companies. Six years of research uncovered a key underlying principle behind the 19 successful companies that they studied: They all encourage and preserve a core ideology that nurtures the company. Even though strategy and tactics change daily, the companies, nevertheless, were able to maintain a core set of values. These core values encourage employees to build an organization that lasts. In Built To Last (1994) they claim that short term profit goals, cost cutting, and restructuring will not stimulate dedicated employees to build a great company that will endure. In 2000 Collins coined the term "built to flip" to describe the prevailing business attitudes in Silicon Valley. It describes a business culture where technological change inhibits a long term focus. He also popularized the concept of the BHAG (Big Hairy Audacious Goal). A company with these key characteristics he called a living company because it is able to perpetuate itself. If a company emphasizes knowledge rather than finance, and sees itself as an ongoing community of human beings, it has the potential to become great and endure for decades. Such an organization is an organic entity capable of learning (he called it a "learning organization") and capable of creating its own processes, goals, and persona. ^ a b Nag, R.; Hambrick, D. C.; Chen, M.-J (2007). "What is strategic management, really? Inductive derivation of a consensus definition of the field". Strategic Management Journal. 28 (9): 935–955. CiteSeerX 10.1.1.491.7592. doi:10.1002/smj.615. ^ Compare a corporation-oriented view: Alkhafaji, Abbass F. (2003). 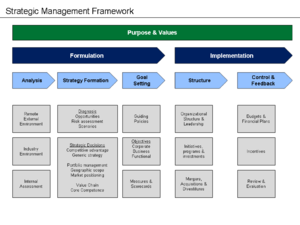 Strategic Management: Formulation, Implementation, and Control in a Dynamic Environment. New York: Routledge (published 2013). ISBN 9781135186357. Retrieved 2018-06-17. Strategic management is the process of assessing the corporation and its environment in order to meet the firm's long-term objectives of adapting and adjusting to its environment through manipulation of opportunities and reduction of threats. ^ Compare broader definitions of strategic management encompassing the management of non-commercial entities: Courtney, Roger (2002). Strategic Management for Voluntary Nonprofit Organizations. Routledge studies in the management of voluntary and non-profit organizations. 5. London: Psychology Press. p. 8. ISBN 9780415250238. Retrieved 2018-06-17. [...] 'Strategic Management' as 'the process of strategic change' (Bowman and Asche 1987) or as 'the process of making and implementing strategic decisions', 'strategic decisions' being those 'that determine the overall direction of an enterprise and its ultimate viability in light of the ... changes that may occur in its ... environments' (Quinn 1980). ^ a b c d e f g h Ghemawat, Pankaj (Spring 2002). "Competition and Business Strategy in Historical Perspective". Business History Review. SSRN 264528. ^ Hill, Charles W. L.; Jones, Gareth R. (2012). Strategic Management: An Integrated Approach (10 ed.). Mason, Ohio: Cengage Learning. p. 21. ISBN 9781111825843. Retrieved 2018-06-17. The feedback loop [...] indicates that strategic planning is ongoing; it never ends. Once a strategy has been implemented, its execution must be monitored [...]. This information and knowledge is returned to the corporate level through feedback loops, and becomes the input for the next round of strategy formulation and implementation. ^ a b c Porter, Michael E. (1996). "What is Strategy?". Harvard Business Review (November–December 1996). ^ a b c Chaffee, E. "Three models of strategy", Academy of Management Review, vol 10, no. 1, 1985. ^ a b Chandler, Alfred Strategy and Structure: Chapters in the history of industrial enterprise, Doubleday, New York, 1962. ^ a b Mintzberg, Henry (1987). "Why Organizations Need Strategy". California Management Review (Fall 1987). ^ a b c d e f g h Mintzberg, Henry and, Quinn, James Brian (1996). The Strategy Process:Concepts, Contexts, Cases. Prentice Hall. ISBN 978-0-13-234030-4. ^ a b Drucker, Peter (1954). The Practice of Management. Harper & Row. ISBN 978-0-06-091316-8. ^ Henderson, Bruce (January 1, 1981). "The Concept of Strategy". Boston Consulting Group. Retrieved April 18, 2014. ^ a b c d e f g Porter, Michael E. (1980). Competitive Strategy. Free Press. ISBN 978-0-684-84148-9. ^ Stacey, R. D. (1995). "The science of complexity - an alter-native perspective for strategic change processes". Strategic Management Journal. 16 (6): 477–495. doi:10.1002/smj.4250160606. ^ Terra, L. A. A.; Passador, J. L. (2016). "Symbiotic Dynamic: The Strategic Problem from the Perspective of Complexity". Systems Research and Behavioral Science. 33 (2): 235–248. doi:10.1002/sres.2379. ^ Camporesi, Alberto (1989). Strategia sì, ma non troppo. Guidare l'azienda tra metodo e intuito. Italy: Franco Angeli. ISBN 9788820430191. ^ a b c d e f g h Kiechel, Walter (2010). The Lords of Strategy. Harvard Business Press. ISBN 978-1-59139-782-3. ^ Ansoff, Igor Corporate Strategy, McGraw Hill, New York, 1965. ^ Henderson, Bruce (1970). Perspectives on Experience. Boston Consulting Group. ISBN 978-0-684-84148-9. ^ a b c Porter, Michael E. (1985). Competitive Advantage. Free Press. ISBN 978-0-684-84146-5. ^ Drucker, Peter F. (1994). "The Theory of the Business". Harvard Business Review (September–October 1994). ^ Beaufre, Andre (1965). An Introduction to Strategy. Translated by R.H. Barry. With a pref, by B.H. Liddell Hart. Frederick A. Prager. OCLC 537817. Unknown ID 65-14177. ^ Mulcaster, W.R. "Three Strategic Frameworks," Business Strategy Series, Vol 10, No1, pp68 – 75, 2009. ^ Scwhartz, Peter The Art of the Long View, Doubleday, New York, 1991. ^ Wack, Pierre “Scenarios: Uncharted Waters Ahead”, Harvard Business review, September October 1985. ^ Elcock, Howard, "Strategic Management," in Farnham, D. and S. Horton (eds. ), Managing the New Public Services, 2nd Edition, New York: Macmillan, 1996, p. 56. ^ a b Hamel, Gary Leading the Revolution, Plume (Penguin Books), New York, 2002. ^ Moore, Mark H., Creating Public Value: Strategic Management in Government, Cambridge: Harvard University Press, 1995. ^ Senge, Peter. The Fifth Discipline, Doubleday, New York, 1990; (also Century, London, 1990). ^ Toffler, Alvin Future Shock, Bantom Books, New York, 1970. ^ Toffler, Alvin The Third Wave, Bantom Books, New York, 1980. ^ Tichy, Noel Managing Strategic Change: Technical, political, and cultural dynamics, John Wiley & Sons, New York, 1983. ^ Christensen, Clayton "The Innovator's Dilemma," Harvard Business School Press, Boston, 1997. ^ "Taking Care of Business, 1995–2005". ScienceWatch. Thomson Scientific. November–December 2005. Retrieved 2012-01-26. ^ Davidow, W. and Uttal, B. Total Customer Service, Harper Perennial Books, New York, 1990. ^ Reichheld, F. and Sasser, E. “Zero defects: Quality comes to services”, Harvard Business Review, September/October 1990. ^ Rumelt, Richard P. (2011). Good Strategy/Bad Strategy. Crown Business. ISBN 978-0-307-88623-1. ^ Barnard, Chester The function of the executive, Harvard University Press, Cambridge Mass, 1938, page 235. ^ Mintzberg, Henry The Nature of Managerial Work, Harper and Roe, New York, 1973, page 38. ^ Kotter, John The general manager, Free Press, New York, 1982. ^ Isenberg, Daniel "How managers think", Harvard Business Review, November–December 1984. ^ Isenberg, Daniel Strategic Opportunism: Managing under uncertainty, Harvard Graduate School of Business, Working paper 9-786-020, Boston, January 1986. ^ Zaleznik, Abraham "Managers and Leaders: Are they different? ", Harvard Business Review, May–June 1977. ^ Zaleznik, Abraham The Managerial Mistique, Harper and Row, New York, 1989. ^ Corner, P. Kinicki, A. and Keats, B. "Integrating organizational and individual information processing perspectives on choice", Organizational Science, vol. 3, 1994. ^ J. Scott Armstrong & Kesten C. Greene (2007). "Competitor-oriented Objectives: The Myth of Market Share" (PDF). International Journal of Business. 12 (1): 116–134. ISSN 1083-4346. Archived from the original (PDF) on 2010-06-22. ^ Barney, J. (1991) "Firm Resources and Sustainable Competitive Advantage", Journal of Management, vol 17, no 1, 1991. ^ Pine, J. and Gilmore, J. "The Four Faces of Mass Customization", Harvard Business Review, Vol 75, No 1, Jan–Feb 1997. ^ Evens, P. and Wurster, T. "Strategy and the New Economics of Information", Harvard Business Review, Sept/Oct 1997. ^ Schuck, Gloria "Intelligent Workers: A new pedagogy for the high tech workplace", Organizational Dynamics, Autumn 1985. ^ Levinson, J.C. Guerrilla Marketing, Secrets for making big profits from your small business, Houghton Muffin Co. New York, 1984, ISBN 0-618-78591-4. ^ Moore, J. "Predators and Prey", Harvard Business Review, Vol. 71, May–June, pp 75–86, 1993. ^ a b de Geus, Arie (1997). The Living Company. Harvard Business School Press. ISBN 978-0-87584-782-5. 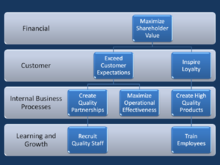 ^ Mulcaster, W.R. "Three Strategic Frameworks," Business Strategy Series, Vol 10, No 1, pp 68–75, 2009. Edwards, Janice et al. Mastering Strategic Management- 1st Canadian Edition. BC Open Textbooks, 2014.